Lose That Girl: RATE IT! 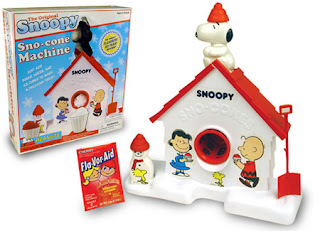 Snoopy Sno-Cone Machine!! IT'S BACK!!! Yes, this vision isn't some retro-tastic dream -- it's the REAL deal! The Snoopy Sno-Cone Machine is back in business! I never had this beauty as a wee kid -- and as a MAJOR, and I MEAN *MAJOR* Snoopy aficionado, that was a crime that never got to right itself. Until now! Me want... oh, yes. And my ice cube obsessed puppy agrees with me. Awesome! I still have my old school snoopy snow machine from back in the day - except I think the shovel went missing long ago. I hope it works better than the original. I remember it took forever to shave the ice. Did you have the Snoopy bowling toy? Snoopy bowling toy???? No, A., I didn't know that there was one! I have the Snoopy transistor radio, bank, floating soap dish... but no bowling toy.